This spring, the Fact team was invited to one of the most beautiful countries in the GCC – Oman. Known for its varied landscape, Oman offers visitors rocky visuals with the momentous Al Hajar Mountains; whilst the country is hugged by a stunning coastline and great beaches; and for those who venture further East, you’ll pass the land of the Wahiba Sands inhabited by Bedouins, and further south you’ll end up in the Dhofar region, full of its own tropical charm. Our trip, however, was to the capital city of Muscat, for a stay at the sprawling Shangri-La’s Barr Al Jissah Resort. It all began at the lovely Qatar Airways Business Class lounge at Hamad International Airport. As far as pre-flight services go, this place had every box ticked – it was quiet, spacious, well-equipped with enough gadget portals and comfy seating areas, and the food selection was great too. Qatar Airways’ first and business class service is really top of the line; from the second we boarded the plane, the flight attendants went all out to make our journey as relaxed and enjoyable as possible. Again, the menu is fabulous with a real gourmet in the air experience, while the entertainment selection is impressive with all the latest, and all-time favourite, films and tons of TV episodes, music and games – we definitely weren’t bored on this two-hour journey! If it’s the VIP treatment you’re after, it’s the VIP treatment you’ll get with the Qatar Airways experience. We landed in Muscat in the evening. The weather was warmer than Doha, but still a very pleasant temperature. The lovely people at Shangri-La’s Barr Al Jissah Resort arrange a transfer to the hotel, a drive which really gives you a quick insight into the city, and certainly leaves a lasting first impression. We drove for around 35 minutes, past neighbourhoods, on the main highways, besides the mountains and through the old gates of Muscat, to arrive at the tranquil Shangri-La’s Barr Al Jissah Resort. At this point, you’ll forget you’re even in the GCC as the contrast of the rugged mountains with the sound of the ocean waves, really seems a world away from everyday life in busy Doha. The Shangri-La’s Barr Al Jissah Resort is a dream. It’s got every kind of scenery your eyes could crave; the rocky mountains, the blue sea, the sandy beach, and the plush greenery – could this be the ultimate regional resort? With a total of 640 rooms located across three hotels; Al Waha, Al Bandar, and Al Husn hotels. There’s everything from classic rooms to VIP suites, and everything in between. This property has every type of traveller covered – families, couples, groups of friends, solo visitors – you’ll all find a room type and package to suit your holiday needs. For us, it was a combination of the excellent location, fantastic amenities, the friendly staff and attentive service, that made our stay in a Deluxe Sea View room at Al Husn, so incredibly perfect. Food, for us, is one of the most important factors when travelling, and Shangri-La’s Barr Al Jissah Resort did not disappoint.There’s a total of 22 dining spots to choose from, so it’s safe to say that there’s something for everyone. Try al fresco dining when the weather permits – nothing beats breakfast, lunch or dinner with beautiful views. Our first dinning experience was at Al Sultanah Restaurant for breakfast, with a range of healthy buffet items and an excellent a la carte menu – make sure you try the amazing eggs benedict. For lunch, head to Al Tanoor Restaurant for an outdoor experience with a gorgeous view. The international buffet here will fill you up! B.A.B lounge is the perfect spot to chill and enjoy a relaxing drink before heading for dinner at the romantic Bait Al Bahr. The fine dining, seafood restaurant has a range of fresh catch of the day and a long list of a la carte choices – delicious! This resort has every adventure and watersport that you’d expect to find in this part of Oman. Paddle boarding, kayaking, waterskiing, the lazy river, a catamaran cruise – you name it, and they’ve got it. 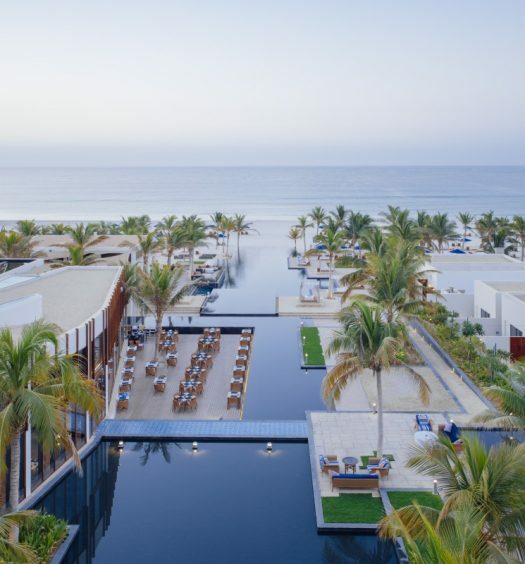 We’d highly recommend venturing out to explore Muscat’s UNESCO World Heritage Site, Ad Dimaniyat Island or opt for watching the turtles on the beach – the hotel can arrange this for you with Ocean Blue Company, who also offer an awesome sunset ride that is an absolute must. After a long day of activities in and out of the resort, there is no better place to pamper and relax than Chi Spa. The Spa facilities of the resort are just amazing; spacious changing rooms and a beautiful walk to get into your personal village for the treatment. We had the Vitality Treatment, designed to strengthen the body, it’s a gentle soothing massage that combines elements of Swedish, shiatsu and reflexology. Honestly, it was one of the best spa treatments we’ve ever had, and left us feeling brand new! We could write many more pages gushing over how mesmerising the Shangri-La’s Barr Al Jissah Resort is, but we’d rather let you book a stay and find out for yourself!